to improved clarity and accurate reproduction of amplitude and phase response. The quality of today’s mobile entertainment is better than ever. But interference caused by factory circuits can keep you from enjoying your favorite music, movies and video games. 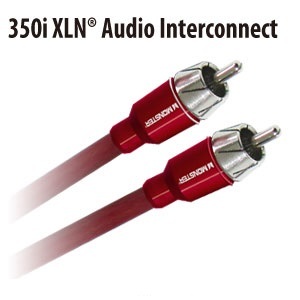 Featuring patented Monster technologies, Monster 350i Series Audio Interconnects enhance signal transfer to your amplifiers for high-quality sound with maximum sonic clarity. 2-way Time Correct® windings separate high and low frequency wire networks for accurate reproduction of amplitude and phase response, while patented Xtra Low Noise™construction provides advanced noise rejection up to 60dB so all you hear is the sound of entertainment. Winding process of separate high and low frequency Oxygen Free Copper wire. Helps provide protection (up to 60dB) against noise producing interference generated in the car environment. Future reinforced ground shell and 6 cuts for improved conductivity and a tight fit. For maximum contact pressure and ultra-low signal distortion. Flexible for easier installs, UV stabilized for maximum durability.